The way to learn a country’s culture is through their food and I always find breakfast to be the most interesting! On my first trip to incredible Morocco, having landed early hours of the morning, my friend Pam and I made our way to our breakfast table, intrigued to see what breakfast was about. We were greeted with the most beautiful day and the sounds of a city waking up. In the courtyard of our beautiful riad, we found our table set amongst magnificent bouganvilla and water fountains. Then to our surprise we were served a steaming bowl of winter soup called Harira which was amazing. A lentil, tomato and chickpea soup filled with goodness and flavour which we were to have lots of in the days to follow. Although this soup is served all year through it is especially favoured during Ramadan to break the fast. All households make the soup with their own family recipe so they differ slightly but basically are all similar. Our breakfast Harira was only vegetables, but we had many of them made with a little bit of meat or chicken. 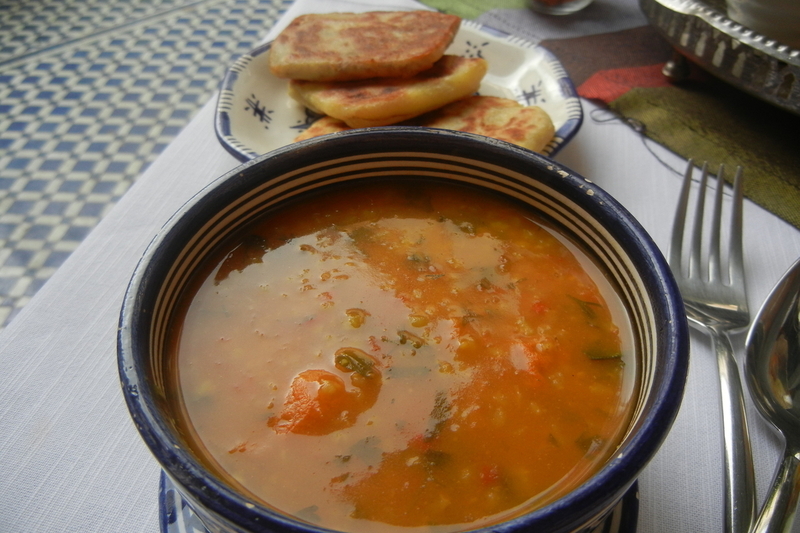 Here is my favourite Harira recipe for you to try during these cold days we are having. I doubt you’ll have it for breakfast but certainly as a starter, or a bowl for a comforting lunch or dinner. A perfect winter soup. Step 1 Heat oil in large pan over medium heat, add onions, cook until starting to soften. Step 2 Now add the parsley, saffron, cinnamon, celery, pepper, lamb, tomato paste, coriander and ginger. Cook on a low heat for a few minutes to let the flavours infuse. Step 3 Add 2 litres of water and 1 tsp of salt to the pan and let it come to the boil over a high heat. Step 4 Then reduce the heat, cover and simmer for about 1 ½ hours. Step 5 Whisk together the flour and 1 litre of water in a pan, add chopped tomatoes and cook over a medium heat for about 18-20 minutes. Step 6 Remove from heat and leave to cool then blend in food processor until smooth. Step 7 Add tomato mixture to other mixture, then add rice, chickpeas and lentils and cook uncovered for about 30 minutes stirring every now and then. Step 8 Whisk together the eggs, pour eggs and lemon juice into soup just before serving. Definitely going to try it – I just love soups! That soup looks absolutely yummy! I can’t remember if you made it for us, but I am most definitely gonna try it soon! It sounds incredibly nourishing and tasty. I will have to try it! Debbie, thanks for sharing. Please do try it Tony. It really is delicious!